Built in 1858 on land donated by Captain William and Elizabeth Howard, this church is one of only two remaining antebellum churches and is the second oldest church building in Baldwin County. The design is typical of the day, a Greek Revival style with country adaptations. It was constructed from heart pine logs with handmade wooden pegs. The interior features the original pews, random-width floorboards (evidence of the crude lumber-cutting methods of the era), and a slave gallery. Before the Civil War, many slaves attended church with their masters, but were segregated to seating in a rear balcony (gallery), which had its own side door entrance. The belfry, damaged by the devastating hurricanes of 1906, 1916 and 1979 (Frederick), has been rebuilt a few times. The black antebellum candle-lit chandelier with six glass globes has been converted to electrical lighting. The original bell, which is lined by silver dollars is displayed at the Daphne United Methodist Church. 5 In the cemetery, grave markers date from 1847 and include two brothers killed in the last two weeks of the Civil War at Spanish Fort, four casualties from the ironclad Osage, the beloved slaves Becky Ann and Snake, and the son of the first Native American to graduate from West Point, David Moniac. Many gravesites are unidentified because their wooden markers decayed with time. Tradition holds that on these grounds there is a mass grave of Union military men, brought ashore after a torpedo hit their freighter. (During the Civil War, a torpedo was a barrel filled with gunpowder and floated just below the surface of the water, ready to explode on contact). In 1924, Peter McAdam enclosed his family plot with clay posts (a Celtic tradition); some of these posts remain intact. 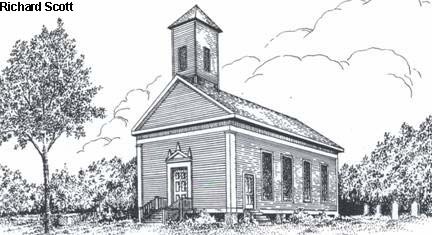 From 1870 to 1939, this church was known as the Daphne Methodist Episcopal Church, South. Then in 1939, when the Methodist congregation reunited and forgot their pre-Civil War differences, the name was changed to the Daphne Methodist Church. Today, the church is a museum of local artifacts.